The distance between your tomato plants will vary depending upon the variety of tomato you've chosen, the type of garden you have and other factors. However, some general guidelines will help you determine spacing. Tomato plants may be of two types: determinate and indeterminate. Determinates form a flower cluster and stop growing higher. Indeterminate varieties continue to grow taller indefinitely and never form a "terminal" flower cluster, only lateral flower clusters. Most of the older, and heirloom, varieties are indeterminate. 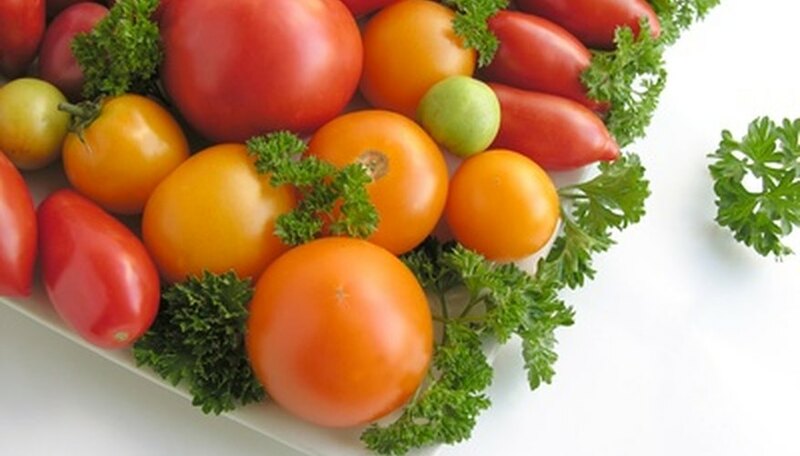 There are many varieties of tomatoes, from orange to pink varieties and from patio tomatoes to cherry tomatoes, large vine tomatoes and Roma tomatoes. First Early Red: These varieties take 60 days or less to reach maturity. They include Sub Arctic Plenty, Early Girl, Early Cascade and Quick Pick. They are well suited for northern areas with short summers. Spacing generally is 15 to 24 inches apart. Medium Early Red: These varieties take 60 to 69 days to reach maturity. They include Champion and Mountain Spring. Spacing generally is 15 to 24 inches apart. Main Crop Red: These take 70 to 80 days to reach maturity. They include Celebrity, Better Boy, Burpee's Big Girl, Supersonic and others. They are called "main crop" because they make the bulk of the home gardener's main tomato harvest. They can also get quite large. They should be staked, put in wire cages or on trellises. Spacing generally is 15 to 24 inches apart. Extra Large Red: These varieties may take more than 70 to 81 days to reach maturity. They include Super Steak, Beefmaster and Delicious Varieties. As the name implies, they bear extra large fruits and may need to be wider spaced in the garden. They also need to be supported with stakes, wire cages, teepees, trellises or garden fences. They should be spaced around 24 inches apart, or more if possible. Dwarf, Patio, Cherry: These include varieties like Super Sweet 100 and Sweet Million. Although the fruit is small, they grow in abundance. 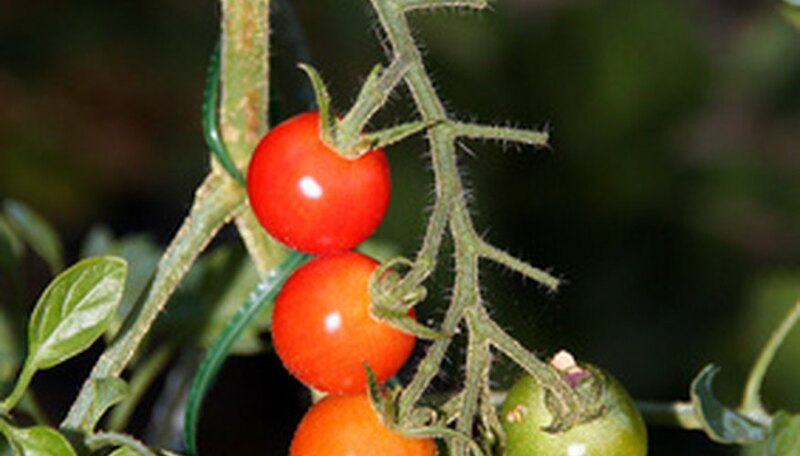 Plant height and spread varies, but generally they grow smaller than the large vine tomato plants. Spacing 12 to 24 inches apart is a good rule of thumb. This type of smaller tomato plant is very well suited for containers and smaller spaces. Your spacing will also vary depending upon the type of garden you have. The traditional "row" garden allows for more space between vegetable plants; however, there is often a lot of space wasted in the row garden. In this type of garden, go ahead and space your plants as wide apart as possible. Square-foot gardening uses a grid of 1-foot squares placed over a raised bed. In using the square foot-gardening technique, you may plant one tomato plant per square foot. In regular raised beds, you may plant 12 to 24 inches apart as space allows. In raised beds, you may want to use wire cages and a trellis or staking system. This will allow you to put more plants in a smaller area since the plants will be growing vertically. Container gardens generally have one plant per pot or container, unless you are using a very large planter. Growing vertically will make your tomato plants occupy a smaller area of soil. This is a good idea for those using raised garden beds, smaller garden plots and container gardens. Growing vertically is accomplished with stakes, cages, fences, trellises and teepees. Add stakes, teepees and cages while the plants are still young to avoid damaging the roots. When you plant against a fence or use a garden stake or trellis system, you can train the vines to grow upward. You may loosely tie slender strips of cloth or garden string around the vine and the support to keep vines going upward. 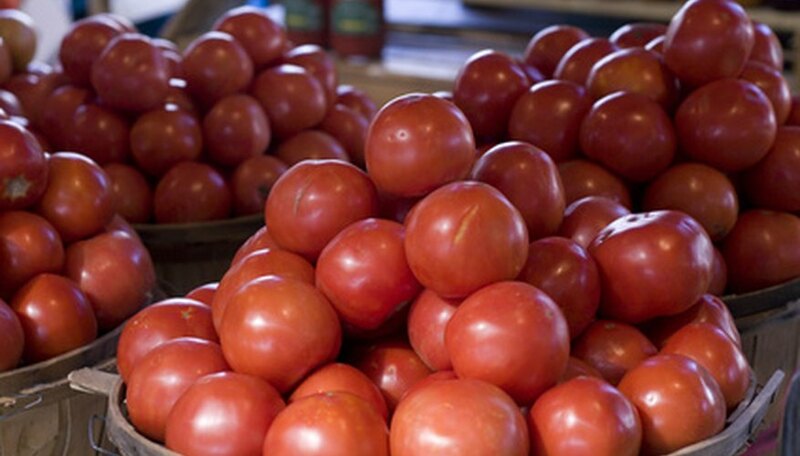 The popular large varieties of tomatoes may grow as high as 6 to 8 feet tall, with a span of 4 feet. They may need as much as 24 to 48 inches between them, with 5 to 6 feet between rows. Envision the size of the mature plant as you're planning your spacing requirements. You can space dwarf varieties 12 inches apart in a row garden, or plant one per container in a container garden. Square-foot gardens are usually planted one tomato plant per 1-square-foot grid. For staked plants, leave at least 15 to 24 inches between the plants. Generally, the smaller the variety of tomato you choose, the less space it will need in the garden. A professional writer with over 20 years of experience, Sally Hansley Odum has been published in print and online in more than 90 countries. Her work has appeared on a variety of websites. Odum also does copywriting for luxury hotels and resorts, which gives her inside knowledge of travel destinations throughout North America. Which Tomatoes Grow Best in Containers? How Long Does it Take to Grow a Tomato?